Musical legends and beloved public figures proved the highlights of the 2019 Grammy Awards. 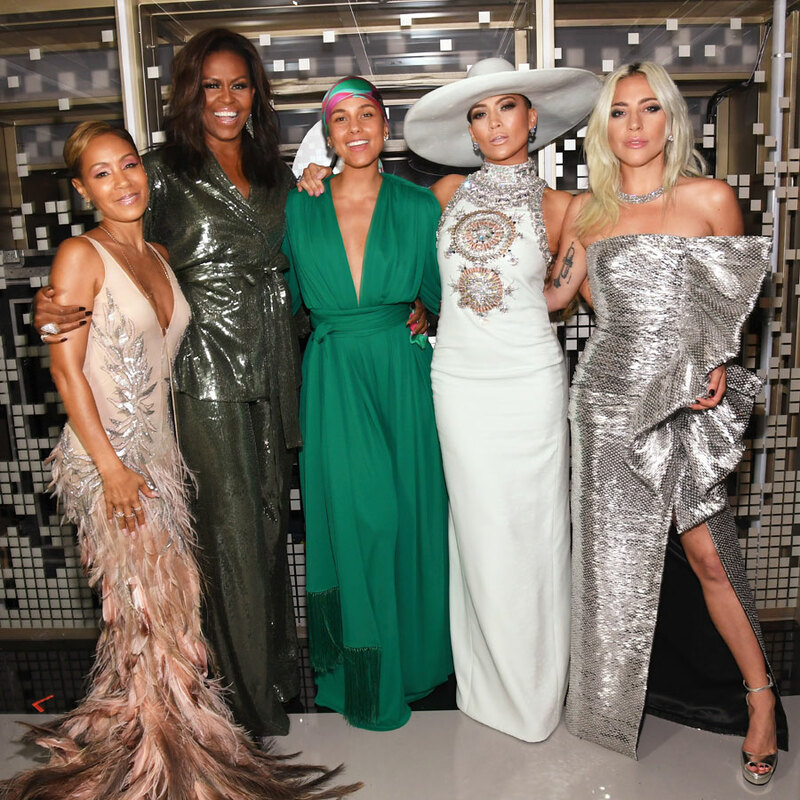 The ceremony, which took place in Los Angeles on Sunday, kicked off with former First Lady Michelle Obama, 55, who received a rousing ovation from the audience when she appeared alongside Lady Gaga, Jada Pinkett Smith, 47 and Jennifer Lopez, 49, to discuss the inspirational role that music has played in their lives. A little later in the show, music legend Diana Ross took the stage in a radiant red gown to celebrate her upcoming 75th birthday by performing a pair of her solo hits – “The Best Years of My Life” and “Reach Out and Touch (Somebody’s Hand).” Ross’ nine-year-old grandson, Raif-Henok Emmanuel Kendrick, introduced her, declaring, “She is amazing. Young people like me can look up to her for her independence, confidence and willingness to be her unique self. She has shown the world that nothing is beyond our reach.” Ross then took the stage to loud applause, noting that, “When I was a little girl I felt the joy of singing. It made me happy, it made my parents happy and it led to this day. And it brings me joy. Through my life there has always been music and its power.” She had the audience on its feet as she performed, swaying back and forth with their hands in the air before ending with an inspirational message – “Together we have no limits. You can learn, dream, unlock new doors. All is possible.” – and closing by shouting “Happy birthday to me!” The moment became an instant hit on social media, as Ross’ actual birthday is March 26. Another major highlight came with the tribute to Dolly Parton, who recently turned 73. In 2016, Parton told me that, “It baffles me because I’m supposed to be old but I don’t feel old. I really can’t tell you how I love to [perform] now and how important it is…I haven’t got as much time as I used to have so I want to make the most of every single minute.” And she did at the Grammys, rocking the stage with performers like her goddaughter, Miley Cyrus, as well as Katy Perry, Kacey Musgraves, Little Big Town and Maren Morris on a medley of hit tunes including “Here You Come Again,” “Jolene,” “After the Gold Rush,” “Red Shoes” and, of course, “9 to 5,” which had everyone in the audience on their feet, singing and dancing along. And speaking of women in music, in a year where controversy pushed the Oscars toward proceeding without a host, Alicia Keys proved a hugely popular choice to helm the Grammys. Cheered on by the live audience and fans watching on social media, Keys didn’t fall into the usual “cynical host who makes fun of everything” routine. Rather, the first female Grammy host since 2005 (when Queen Latifah did the honours) made the night all about positivity and the shared love of music, acting as MC while taking the time to perform parts of 10 different songs during the show, including one point in a medley that saw her playing two pianos at the same time. Keys, a versatile songwriter and performer, also acted as something of a musical bridge between generations, playing varied tunes like the 1899 ragtime song “Maple Leaf Rag,”the Nat King Cole classic “Unforgettable,” the Coldplay hit “Clocks” and her own collaboration with Jay-Z, “Empire State of Mind,” among others fluidly and without missing a beat. She also participated in the Grammy Motown tribute alongside 78-year-old Smokey Robinson, Jennifer Lopez and singer-songwriter Ne-Yo and invited her friend, Michelle Obama, to participate in the show, with the former First Lady tweeting, “A big part of friendship is showing up for your girls—that’s why I was thrilled to be there for the one and only @aliciakeys at the #GRAMMYs. She is one of the most genuine and thoughtful people I know—there’s no one better to help us all celebrate the unifying power of music!” And when it comes to all-purpose, dynamic hosts that keep the show upbeat and get everyone grooving, we’re think Keys should be on the radar for every awards show moving forward. Meanwhile the Grammys also saw Toronto’s Drake take home the award for Best Rap Song for “God’s Plan.” He did, however, use his speech to call out perceived lack of recognition of hip hop artists by the Grammys, noting, “This is a business where sometimes it’s up to a bunch of people that might not understand what a mixed-race kid from Canada has to say, or a fly Spanish girl from New York, or a brother from Houston. But the point is, you’ve already won if you have people who are singing your songs word for word.” He then held up his Grammy and added, “You don’t need this right here.” Drake’s speech was then cut off by music, but the moment became one of the most talked about of the night. Hip hop did make history on the night, however, as Childish Gambino’s “This Is America” became the first hip hop tune to win Record of the Year and Song of the Year while Cardi B became the first female solo performer to take hom the award for Best Rap Album. And when it comes to the 45-plus age group, 2019 Grammy winners included Willie Nelson, 85, for Best Traditional Pop Vocal Album (My Way, a tribute to Frank Sinatra), Sing, 67, and Shaggy, 50, for Best Reggae Album (44/876), Beck, 48, for Best Alternative Music Album (Colors), Buddy Guy, 82, for Best Traditional Blues Album (The Blues is Alive and Well), former U.S. President Jimmy Carter, 94, for Best Spoken Word Album, Includes Poetry, Audio Books & Storytelling (Faith: A Journey for All) and the late Chris Cornell, 52, for Best Rock Performance (“When Bad Does Good”). Click here for a full list of 2019 Grammy winners.